Being a homeowner isn’t all furniture and shower curtains… it’s about taking care of the whole house, the good, the bad, and the expensive. One of the first things I noticed when I bought this house is how much the utilities are. Before I have always lived in smaller apartments or homes and I have shared the utilities with at least one roommate. 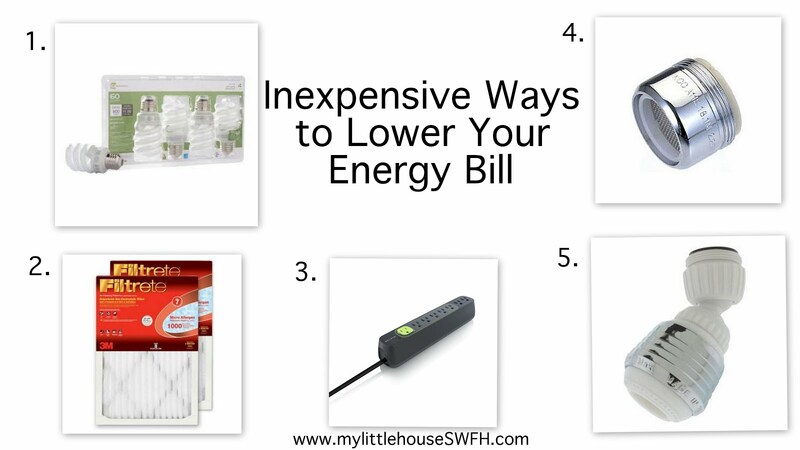 So lately I have been trying to think of ways to lower my energy bills. Mostly I have been trying to keep my thermostat at a lower temperature but here are some other things that I have done for a while, some new things I’m trying, and some that I hope to do in the future. CFL lightbulbs are those crazy looking swirly lightbulbs. I’ve been using them for years now and I highly recommend them. They are 75% more efficient than regular lightbulbs. The technology is advancing every day and so some of the issues that used to annoy people about these bulbs have been corrected (for example: they no longer hesitate when you turn them on, the light isn’t blue-ish any more, etc). They also aren’t as expensive. I remember when I first started buying them they were like $10 a piece and now I buy them at Target where they are 5 for $19. Unless you have fancy furnace filters most filters are only about $10-20 and they will help your furnace work more efficiently (plus, less dust!). I am bad about remembering to do this so I finally put a reminder on my phone so that I won’t forget. Did you know that even when your electronics are off they are still sucking energy from the wall? I’m sure you guys know that but I didn’t until just a few months ago. I guess I just never thought about it. Power strips are a great way to completely shut off electronics so that they don’t use unnecessary energy. They also now have these ‘smart’ power strips that will shut things off automatically. I had never even heard the word “aerator” before a few weeks ago. They are that little piece under your faucet that can twist on and off. A typical aerator uses 2.2 gallons per minute but they sell ones that only use 1.5 gallons per minute. So for only a few bucks you can use half the amount of water you typically use! Also, reviewers of the product say that you can’t tell the difference in the water pressure. I haven’t changed mine yet but next time I’m at the hardware store I am going to buy one for each of my sinks. All of these things together will only cost about $50-60 and they should help you lower your energy bills.